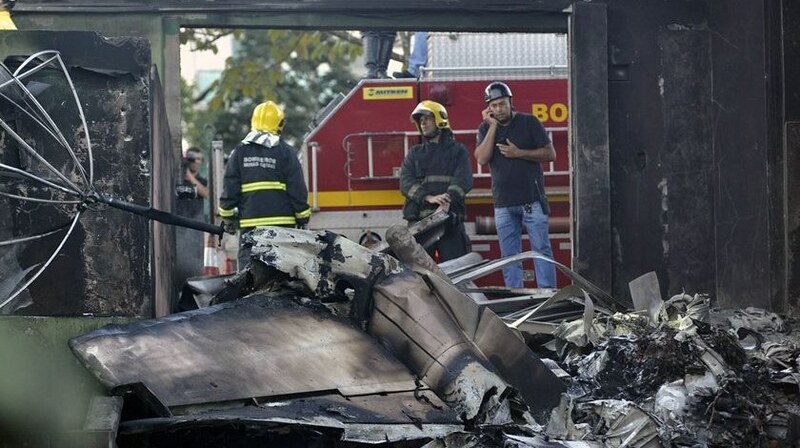 Eight people were killed when an executive jet crashed into an industrial warehouse in southern Brazil, barely missing a nearby church holding service. The twin-engine Piper Navajo jet crashed onto the facility belonging to the Excellence transportation company Sunday night in Cambe, Parana state, hitting a bus and exploding on impact. Local residents who witnessed the crash told reporters the incident could have been even more tragic, as the aircraft fell only some 20 meters far from a church, where about 300 people were attending a service. According to a police report, the two crew members and six passengers, including at least three minors, were heading to Londrina, a city near Cambe after a wedding in west-central Mato Grosso state. The passengers were all relatives of the president of Brazilian union of cooperatives Fenatrocop, Mauri Viana, who had flown in a separate plane with his wife, a daughter and son-in-law, the union’s website said. The victims were Viana’s ex-wife, two daughters, grandson, brother, and sister.